The Trust provides mental health, learning disability, drug and alcohol and community health services across Cheshire and Wirral and within Liverpool, Bolton, Warrington, Halton and Trafford. Cheshire and Wirral Partnership has over 15,000 foundation Trust members and employs nearly 4,000 staff across 95 sites, serving a population of over a million people. 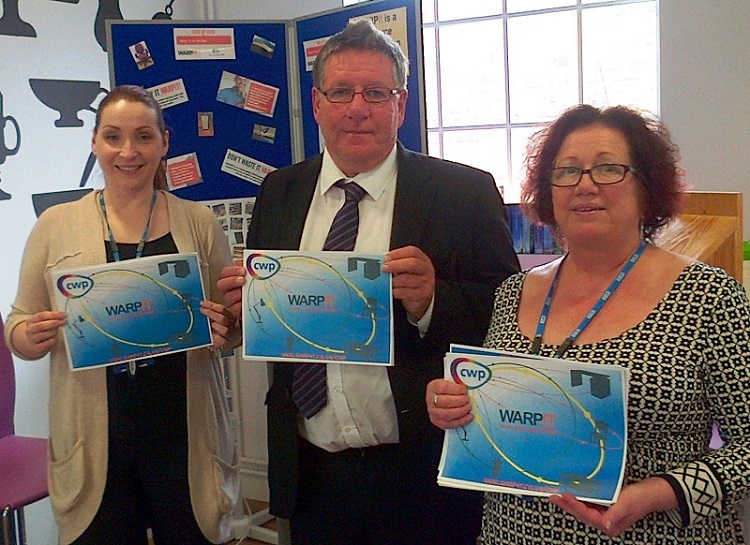 The Warp it system was launched by the Environment Team, Jeannie Metcalfe-Hall and Helen Kelly, at CWP on the 4th June. In the first 8 weeks the Environment Team are pleased to report that over 100 staff have registered to become users of the site and there are currently approximately 600 items available for re-use across the system. To date the total cost savings made from avoided procurement spend and associated disposal costs are in excess of £15,000 mark and the Trust has also achieved a carbon reduction totalling 2980 kg. In these times of improved efficiencies, organisations are learning how important it is to get maximum value out of their resources, and being an environmentally conscious Trust, CWP is always looking for innovative methods to enable us to realise our corporate responsibility goals. Warp it addresses both of these issues and the resulting savings and benefits can be clearly identified and are measurable. Jeannie Metcalfe-Hall is Environment Officer / Waste Manager and Jeannie ran a successful internal reuse scheme, which was called Swap Shop. 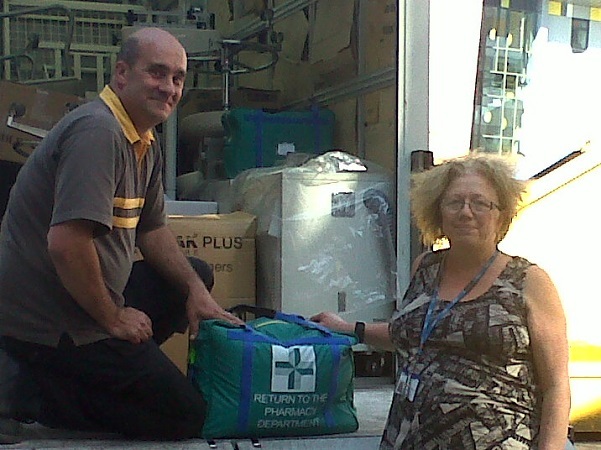 Like most organisations of our size we had a problem with disposing of reusable furniture and equipment. I was concerned with the large amount of “reusable stuff” either going to landfill or skipped , so I set up the Swap Shop to tackle this. Helen, Andy Styring, Director of Operations for CWP and Jeannie on launch day. This system worked well but was ran by one person who took calls and requests and had to rely on brain power to match surplus items with requests. This meant that it took her away from other tasks and also if Jeannie was not here for whatever reason, reuse and reycling did not happen. The Swap shop worked well locally but as the Trust is so widely spread out geographically not everybody was able to get involved equally. However, with a large scale building rationalisation programme approaching it was time to look to see if there was anything on the market which could possible improve the process and free up Jeannie’s time. After seeing a presentation about Warp it, Helen and Jeannie discussed and explored the system in depth. We had a number of meetings about the rollout with various internal stakeholders. We went very quickly from testing the system, to a small trial, and then right out across all staff. When we launched we actually had a photo of one of our execs endorsing it on the ‘official’ launch day which went into the newsletter to encourage staff to sign up. The service and the software have been very well received by staff. We are going through some large rationalisation projects and some buildings have not been touched in a while which has thrown up some unusual items. For example we cleared lots of bird boxes and these were claimed straightaway by a charity. When introducing any change to any system it is important to make things as easy as possible for the staff. I like how the notifications on the system can be customised for the organisation’s own practices – this keeps everyone in line and knowing what to do next. For example in our ‘claim confirmation’ notifications, we have a link to our porter request form. As with any change to behaviour or processes there are always issues. There have been a number of stumbling blocks in setting up the system. Our IT infrastructure at first meant that some of the webpages did not display correctly and notifications were not being received. But this was overcome with a few phone calls and some tinkering behind the scenes. The biggest hurdle is changing practices within other departments. Staff are used to doing things a certain way. Warp it is something that is a bit different and so this has led to some resistance in some areas. To help with this issue we have spent time on supporting and gradually getting the resistant departments on board. However it is important that each department works in collaboration- procurement, facilities management, porters, etc. This activity benefits all departments right across the organisation. We need to ask ourselves, are reuse and financial savings important? If so, then departments have to change the way they do things. Helen went on to explain how having data where they didn’t before has led to benefits. I like how all of the transactions can be exported as an Excel file (both active and claimed) for reference, audit and reporting. This has been seen as a benefit by my manager who can now report accurate financial and environmental savings from our reuse activities. Referring to 3rd party donations Jeannie discusses how some items are hard to reuse due to offices getting smaller. Large desks and beds are usually hard to reuse. We were just about to have a clear out and we had a dozen 1600mm radial desks which wearerework.co.uk took. It is great to see what would have previously been moved, dismantled and then skipped going to good use. We have actually met some partners face to face, such as Chester University and Chester Furniture Forum, to discuss how we can work together better. We have invited a couple of local charities and Local Authorities to partner with us now that we are getting established. When we first launched we kept the marketplace internal only, but as we have got used to the control mechanisms we are now ready to open up to other parties. Astra Zeneca has just joined locally, so it would be good to trade medical and lab equipment or supplies. It is getting quite active out there now. We just need to get all departments collaborating, so that staff 100% trust the system and think of Warp it before they buy or dispose of anything.